ALL eligibility is determined by your home address, not where your child will be transported to or from. It is possible to bus to and from an address other than your home, but the address needs to be within the district, within the area school of attendance, and also within a bus area. Addresses cannot be in a walk zone (see below) in order for busing to be provided. The transportation must be the same every day. For example: the bus would go to and from the alternate (e.g. Daycare) address every day or to your home address every day, but never changing between the two. All Kindergarten and 1st grade students will need to have an authorized person to release the student to the bus driver and to receive the student at the bus stop in the afternoon. Are you eligible to ride the bus for free? All students in grades K-8 who live 2 miles or more from their school and all students in grades 9-12 who live 3 miles or more from the high school are eligible. 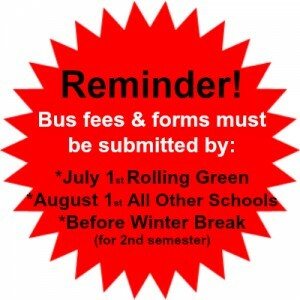 If you are considering Rolling Green for your student, you may be eligible for free transportation. Please contact Sandy Walters to verify your eligibility (contact information below). ARE YOU ELIGIBLE TO RIDE THE BUS FOR A FEE? All students who live outside the walk zone for their school (see Walk Zone links above), but within the 2-mile OR 3-mile limit may be eligible to purchase a bus pass under the following conditions: (1) There is space on an existing route. (2) Students can be picked up at an existing stop within the school district boundaries. If you live in an area where you are required to pay fees, ALL fees must be paid prior to your student being added to a route. You may choose to pay by Semester. We do not send invoices for 2nd Semester – you will need to remember to submit a new bus request form and payment for 2nd Semester prior to winter break. Transportation fees can be paid through the online registration program (as you register your student) or through the Administration Office. If paying with a check, please make checks payable to Urbandale Schools. Fees for students receiving Free or Reduced Lunch, and having the Confidentiality Wavier on file, can also be paid through the online registration program (as you register your student) or through the Administration Office. If paying with a check, please make checks payable to Urbandale Schools. Without the Waiver, full payment of fees will be required prior to your student being added to a route. To be on a route for the first day of school, your request needs to be received no later than July 1st for Rolling Green and August 1st for all other schools. We will be happy to add your student after the due date, but the bus stop locations will be set; thus, students may have to walk farther and possibly wait several days before they can begin riding the bus. Special Education students have the same busing rules as general education students unless their IEP specifies specially designed transportation service. Students with specially designed transportation may need to have an authorized parent meet them in the afternoon, depending on the nature of the disability and the age of the child. Open enrolled students do not qualify for busing. Parents are responsible for student’s transportation to school. 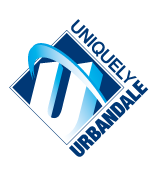 There may be an option for parents to purchase bus services within the Urbandale District. In this case, parents must provide transportation to an existing stop. The stop must be on a route that has space and serves the school the student is attending. Transportation assistance for those who qualify according to income guidelines is available only between contiguous districts. If you have questions or concerns regarding transportation please feel free to contact Durham Student Services. If you have questions regarding bus fees, or adding your student to a route, please call the Urbandale CSD Administration Office.